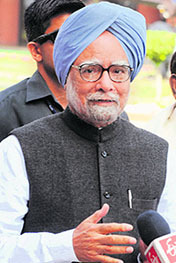 As the ruling coalition geared up to face a fresh challenge from the Opposition in Parliament, Prime Minister Manmohan Singh asserted that the government has the numbers needed to ensure its stability. The 23-day-old pro-reservation agitation by the Jats, which held the state government to ransom, has been suspended till September 13. 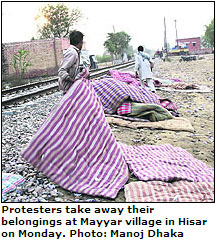 This was announced by Mahendra Singh Poonia, General Secretary of the Haryana unit of the All India Jat Aarakshan Sangharsh Samiti, at Mayyar village, near here, this evening after cremation of 20-year-old Sandeep, who had died in a clash with the police. The Centre and state governments today got down to sorting out the imbroglio over the National Counter Terrorism Centre (NCTC) after days of vocal opposition to the anti-terror hub in its present form. There were indications of a forward movement after a meeting in the National Capital today. After marathon consultations for over 150 hours among senior Congress leaders, Vijay Bahuguna, the party�s Tehri Garhwal MP, was named the next Chief Minister of Uttarakhand. The former Mumbai High Court judge will replace first cousin Maj Gen BC Khanduri (retd) as Chief Minister. 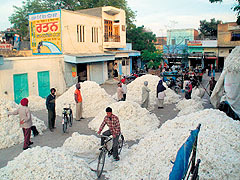 The cotton price here witnessed a forward leap of about Rs 230 per quintal today as the Centre yesterday lifted the ban on its export. Its arrival in the markets of the Malwa region, including Punjab, Rajasthan and Haryana, picked up as farmers came out with their held back produce. Was Sikh history on SAD chief Sukhbir Singh Badal�s mind when he chose Chappar Chiri for the swearing-in ceremony on March 14? 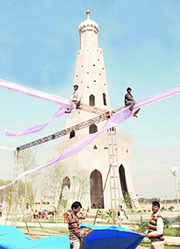 Parkash Singh Badal will take oath as Chief Minister there. Sources said Sukhbir had earlier shortlisted PCA stadium at Mohali for the function, but opted for Chappar Chiri later.